"In recognition of this, his endless courage, we honor him as the fighting spirit of NOBLE." Chief Warrant Officer Jorge-052 (pronounced in the same way as "George") was a Spartan-II supersoldier of the UNSC Naval Special Warfare Command, attached to Special Warfare Group Three. He fought during the Fall of Reach in 2552 as a part of NOBLE Team under the call sign Noble Five. Jorge was born in the small city of Pálháza on Reach on March 5, 2511, and was abducted and conscripted into the SPARTAN-II program by Dr. Catherine Halsey in 2517 when he was six years old. While on Reach, he was trained by the AI Déjà and Chief Petty Officer Mendez along with the rest of the Spartan children. During his first day of training, a trainer mispronounced his name by calling him by the Spanish pronunciation. Jorge quickly corrected the trainer only to be shocked and reprimanded for "back talking". In 2525, he and the other candidates underwent a series of augmentations to improve their overall combat prowess in several different fields. Jorge was among the candidates who survived the procedure. 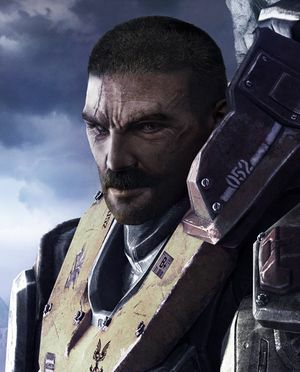 Jorge was transferred from the main Spartan-II contingent (under the operational command of Naval Special Weapons) to UNICOM's SPECWAR Group Three at an unknown point during the Human-Covenant War. His reassignment may have been facilitated under the guise of being too heavily wounded to continue active duty. [note 1] He had been assigned to NOBLE Team as of April 2552, when the unit participated in the Battle of Fumirole. Thom-A293 was killed during this mission and his death would deeply affect the other members of the team, including Jorge. "Jorge. NOBLE Five. It's good to see him home again. But the Fall of Reach will weigh heavily upon him, and this mission will test every last ounce of his strength." Jorge-052 fights the Covenant in Visegrád. Jorge served with NOBLE Team under the call sign "NOBLE Five" during the Fall of Reach in 2552. He served as a heavy weapons specialist, and was the only Spartan-II on the team. On July 24, prior to the Fall of Reach, Jorge, along with the other members of NOBLE Team, investigated an incident at the Visegrad Relay. There, they discovered that Covenant forces had bypassed Reach's defenses and had infiltrated key installations and communications centers. During the preliminary stages of the Covenant invasion of Reach, Jorge and NOBLE Team partook in multiple operations against Covenant forces on the surface of Reach, including a counter-offensive operation to retake the Office of Naval Intelligence's Sword Base on July 26 and a large-scale UNSC assault on a Covenant-occupied site and the neutralization of a Covenant Spire on August 12. Realizing the presence of the Covenant supercarrier Long Night of Solace after the Battle of Viery as a great threat, Kat-B320 of NOBLE Team devised Operation: UPPER CUT, a plan which involved using a YSS-1000 Sabre starfighter to deliver a makeshift slipspace bomb to the supercarrier and destroy it via a slipspace rupture. After receiving authorization from Colonel Urban Holland, the team traveled to a besieged Sabre research facility and assisted the defending UNSC forces in repelling the attackers. Jorge and SPARTAN-B312, NOBLE Six, boarded a Sabre and launched into space to join the Epsilon Eridani Fleet. After rendezvousing with the UNSC fleet, the Sabres helped repel the Covenant invasion force and escorted the UNSC Savannah in commandeering the Ardent Prayer, a Covenant corvette. Savannah diverted the corvette's fire, allowing NOBLE Six and a team of boarders to infiltrate the ship's hull and to allow a Pelican carrying Jorge, the bomb, and UNSC reinforcements inside the ship. Jorge and Six then used the hijacked corvette, which was on course toward the supercarrier to refuel, to transport the slipspace device within range of the supercarrier. After Covenant forces were defeated, Jorge discovered that they were not only cut off from their Sabres, but that the thrusters on the Pelican were damaged during the firefight, and that in order for them to return to Reach, the Spartans would have to free-fall back to the planet's surface. He had also found that the timing device that would have been used to activate the slipspace drive was damaged, and that the only alternative would be to trigger it manually. — Jorge's final words to NOBLE Six. Jorge from the perspective of Spartan-B312 before pushing him out of the Ardent Prayer. Jorge resolved that he would stay to activate the slipspace device himself, and, realizing that doing so would cost him his life, entrusted NOBLE Six with his dog tags before forcing his fellow SPARTAN off the Ardent Prayer. He left Six with the words, "Tell them to make it count." As SPARTAN-B312 drifted away from the ship, Jorge activated the bomb, opening a slipspace rupture that enveloped the Ardent Prayer and a large portion of the Long Night of Solace's midsection, sending it into the slipstream with no way out. Operation: UPPER CUT was a success, though it resulted in Jorge's death. Jorge attempts to comfort Sára Sorvad after the death of her father. "The big man was sentimental." Jorge was the only member of NOBLE Team that had seen as much action, if not more, against human militants as Covenant forces. Described as being very difficult to read, he was free with his opinions, vocal in his support of provincial self-rule, and just as vocal in his condemnation of the separatist and insurrectionist movements. He was shown to be empathetic and caring toward civilians; a trait few other Spartans shared. He was also particularly attached to his home planet of Reach, going so far as to sacrifice himself in order to save it. Like all SPARTAN-IIs, Jorge had seen almost thirty years of action during his career and showed no signs of breaking or slowing. In a performance report, he was noted as "inspiring confidence in those around him" and being "rock solid" despite his long military career. According to Colonel Holland, Jorge was an excellent card player. Though naturally strong and driven, Jorge was not selected for the SPARTAN-II program based on his physical strength and tenacity alone. Indeed, where others failed Jorge often had a plan, and he preferred to overcome obstacles with subtlety and minimum expenditure of lives and resources. While brave and exceptionally lucky, Jorge was something of a fatalist toward the end of his career, believing that he had long outlived the span of time allotted to a Spartan warrior. For this reason, he would often take risks he deemed worthwhile for the good of his unit and the UNSC. Jorge was fluent in the Hungarian language; he speaks Hungarian at various points, including one instance where he introduces himself by saying, "A nevem Jorge" ("My name is Jorge"). This is likely due to the fact that Reach, Jorge's home planet, had a significant population of Hungarian descent. Jorge himself was from Pálháza, a city on Reach that shares its name with a Hungarian town on Earth. Jorge wore a MJOLNIR Mark V grenadier helmet with a reddish-bronze visor and a UA attachment, the Collar/Grenadier[UA] chest piece, and grenadier knee pads with his Mark V MJOLNIR armor. He used the Grenadier shoulder for the left shoulder, EVA shoulder for the right shoulder, and UA/bracer supplementary armor for both forearms, along with supplemental armor on his lower legs. He has a Mark IV/LBE-A Field Case on his back, which he sometimes removed, most likely for increasing his agility. His weapon of choice was a modified personal M247H Heavy Machine Gun that he referred to as "Etilka"; this modified machine gun lacked shield plating and a heat cover over the barrel, among other small differences. Check out our collection of quotes related to Jorge-052 in its quotes page. "S-052" stenciled on a Scorpion tank in Halo: Reach. Jorge was voiced by Hakeem Kae-Kazim, who also provided the voice of Dr. Endesha in Sadie's Story. Jorge's blood type was B+, as seen on the upper left corner of his chest plate. Interestingly, his blood type as listed on his dog tags is A+, but was not readable in-game. Jorge's helmet is available as an Avatar Award and can be obtained by earning a Killtacular in multiplayer matchmaking. Jorge's death is notably similar to that of Sergeant John Forge. Both died by manually detonating slipspace drives that had been converted to bombs in order to end a Covenant threat, having to stay behind because the bomb was damaged and would not detonate autonomously at the right time. They both voluntarily gave their lives to save a Spartan: NOBLE Six in Jorge's case and Jerome-092's in Forge's. This similarity has been noted on Halo Waypoint. Jorge's birthday (March 5) is the same as that of Marcus R. Lehto, Bungie's art director on the Halo series. 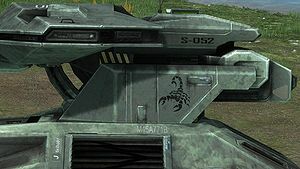 Much like how Lehto's birthday was stenciled on the Scorpion tank in Halo: Combat Evolved, Jorge's Spartan tag (S-052) is printed on the tank in Halo: Reach. At one time Jorge was planned to be in Halo 3: ODST. Jorge may be named after Jorge Lorenzo, a professional motorcycle road racer who wore an ODST-themed helmet in one of his races. Early concept art of Jorge-052 for Halo: Reach. Concept art of Jorge's helmet. A concept art piece of Jorge without his helmet, with Emile-A239 and Carter-A259. An older render of Jorge, with some differences in colors. The Mark IV/LBE-A Field Case that Jorge wears on his back. Jorge along with Emile and Carter. Jorge from A Spartan Will Rise ViDoc. A close-up of Jorge in armor. A drawing by Dr. Halsey of Jorge and other Spartans in a shooting range. A heavily redacted version of Jorge-052's deployment details, sent from Colonel Holland to Dr. Halsey. A Series 1 action figure of Jorge. 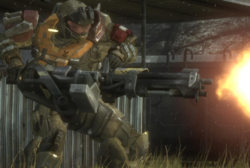 A six-year-old Jorge is struck by a trainer with a humbler stun device in Halo: The Fall of Reach - The Animated Series. ↑ In Halo: The Fall of Reach (page 240), Dr. Halsey claims that all available Spartan-IIs (save for Gray Team, who are out of contact) have been assembled on Reach for Operation: RED FLAG. She states that three have been killed in action and one has been too heavily wounded to continue active duty between 2542 and 2552. In a personal journal entry dated August 27, 2552 (the day of the briefing), Halsey notes that she had lied in some way during the assembly ("That lie about all the Spartans gathered here, save for Gray - will that come back to haunt me?"). While her lie almost certainly regarded Jorge's deployment on Reach (as she notes that he is "obviously preoccupied" in the same entry), whether this means that Jorge was the wounded Spartan is unclear.